I'm a big music lover and for me, it combines perfectly with my love for reading and I pretty much always have music playing in the background, whatever it is I'm doing. But the first edition of my book club's epic readathon sleepover made me realise that not everyone does this. Two of my book club friends cannot tolerate noise while they're reading, while I get distracted when it's quiet cause then I hear EVERYTHING and music is an expected noise that adds to my reading pleasure. But I'm also one of those people who tended to sing along to the music while doing homework, so I can combine most of any mental activity with music. It also actually helps me remember everything better and I have a lot of memories that are linked to songs. So, how about you? 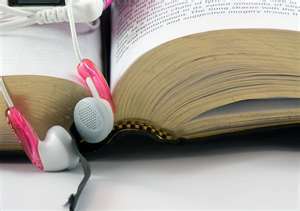 Do you listen to music while you're reading or do you prefer a more quiet environment? Let me know! I'm not really a music person. I much prefer listening to audiobooks. So I don't ever put music on when I'm reading or doing anything else. I could read with music on. I often read while my son is watching TV or while my husband plays video games, so I'm pretty good at filtering out the noise. I love listening to music while I read but I've noticed that (as I get older...) it can't be new-to-me music. If it's something I've never heard before I get distracted and focus on the music instead of reading. I do need something, though. Like you, if it's too quiet I hear EVERYTHING! I have the tv on when I read as background noise, if I listen to music I want to singalong and that distracts me from what I'm reading. For me it really depends on what I'm reading. Because I read in English and it is not my first language some books require my utmost attention and it involves complete or partial silence. If on the other hand the book I'm reading is more fluid and not as demanding I sometimes put on some instrumental music or something acoustic. The same thing goes when I'm studying. I absolutely love music and really wish that I could read while listening to music, but unfortunately I usually can't concentrate on other things when music is playing. The worst thing is having the TV on while I try to read or write. It's so distracting! I am slowly trying to teach my brain how to focus better on reading and/or writing while also having noise in the background, if that's possible. I love listening music every moment but I just can't read when I am listening music at the same time. That distracts me. If I hear the most insignificant noise, I just can't concentrate. I know, weird hahaha. But the most funniest thing ever its that If I am studying, for example, I need to listen some acoustic music or movie soundtracks. I love having music on in the background! But, like Becky said in an earlier comment, I can't listen to something new if I'm reading/writing. When I'm trying out new music (whether it's a new album from a favourite band or an unknown-to-me song), I like focusing on it, which makes it hard to multi-task! Yes!!! I have music on all the time when I'm reading. Like you, I am a huge music fan. I can't. Unless it's instrumentals. And even then not always. I end up either focussing on the music and rereading or focussing on the book and repeating a song ten times because I missed something.